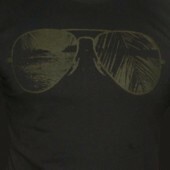 I have an unhealthy obsession with two things: t-shirts and mirrored aviator sunglasses. Since I pretty much always wear t-shirts that get a reaction out of people, the mirrored glasses help me to walk non-chalantly through crowds of people while scanning for people seeing my shirt, getting it, and smiling/laughing/giving me the finger. So I was really stoked when Guerilla Skin Clothing sent me an email to check out their site and I saw this tee. Imagine wearing this tee AND wearing aviator sunglasses. All I’d need is pants with an aviator design on them and I’d be set. Conor at GSC passed along a special coupon just for Preshrunk readers. Use the code “PRESHRUNK” and get 10% off. @Tilly: Guerrilla Skin Clothing is in Northern Ireland. If I’m being an ignorant American for not understanding the difference, please flame me below. If only the reflection on my chest were that exotic and tropical.